* At the time of writing the price in GBP was an estimate, based on the prices for similar sets in the first wave. Pamper every pet at the Heartlake Pet Salon! Celebrate the grand opening of the Heartlake Pet Salon! Everyone’s excited to check it out! Help Emma to shampoo her friend Joanna’s pretty white poodle in the bubble bath, then trim and clip her on the rotating grooming table. 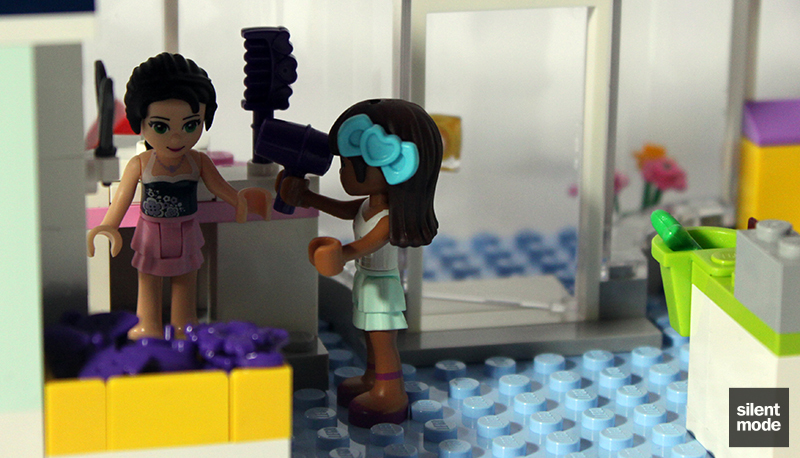 Use the blow dryer and brushes to make her perfect! While Joanna is waiting for her puppy to be groomed, help her to shop for new pet food and lots of accessories in the salon’s shop. Then fill up the water dish at the tap for the poodle to drink. 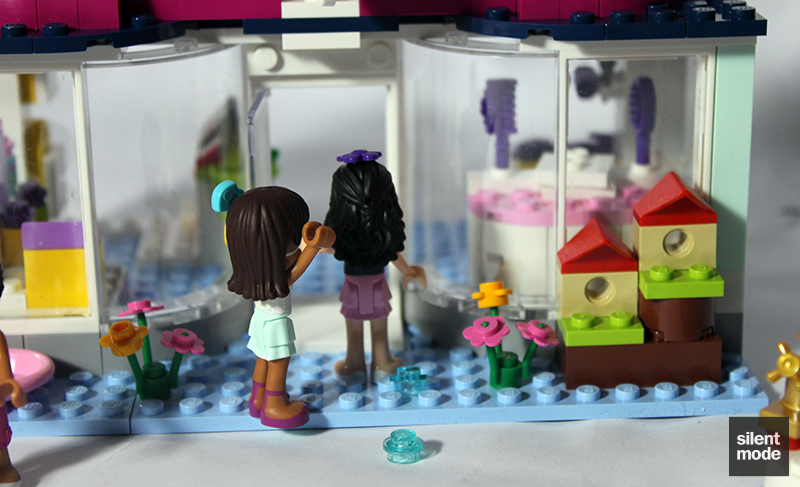 With all of these accessories and functions, you can really pamper all of the pretty pets in Heartlake City! 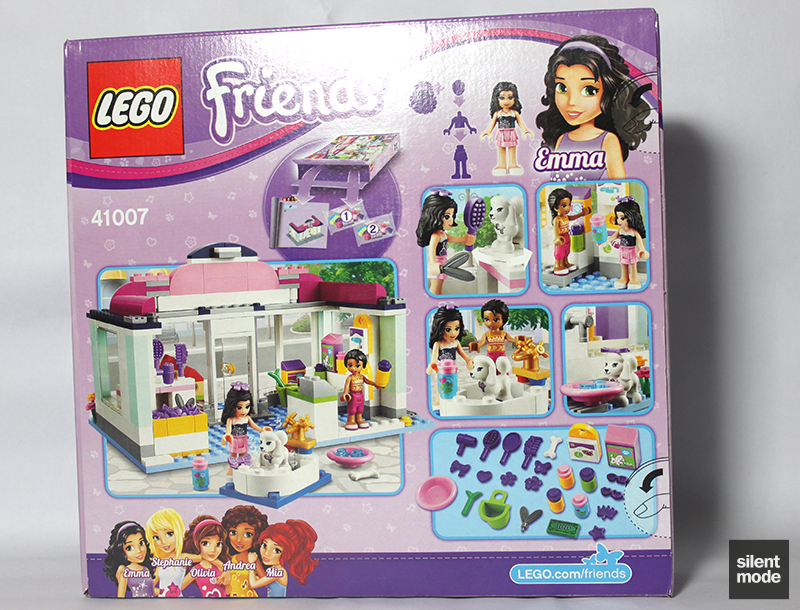 Includes Emma and Joanna mini-doll figures and a poodle. Shop for everything your pet needs! Customize your model by moving the different elements around in the shop! It’s the one they call the Friends Fiend, Mr SilentMode himself, and here’s the review of the third and final set I was able to get hold of before most people in the UK. It’s also the largest of the three sets I obtained, and therefore took a lot longer to photograph than the other two, so I’m getting back into the swing of things. Both Emma sets I’ve reviewed have achieved the much sought-after Silent Approval badge, and hopefully it has nothing to do with her being my favourite character. Will this set earn her a third? The set is blessed with a nice and sturdy box, unfortunately pictured here with a glare from the lighting. Everything looks a little more radiant than usual, and we’re getting flashbacks of some of the earlier sets (namely City Park Café and Heartlake Vet). As usual the various play features are advertised on the back of the box, along with the hand-drawn and much older-looking Emma. 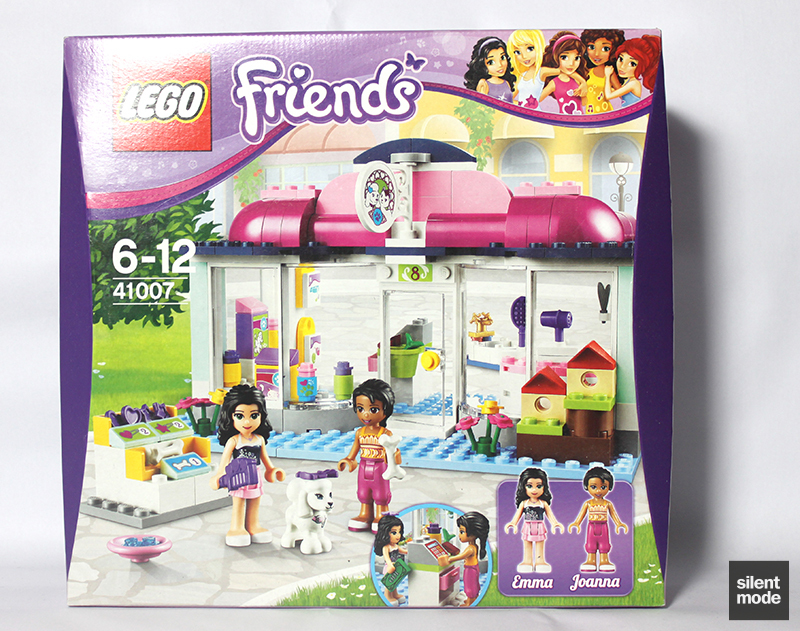 Strangely this box design doesn’t include pictures of other Friends sets, just the group picture featuring the main characters. We shouldn’t really expect to see much on the sides of the box, and we don’t. Emma in her new outfit is used as the scale reference on the long side, and there’s the usual warning about choking hazards in six million languages. 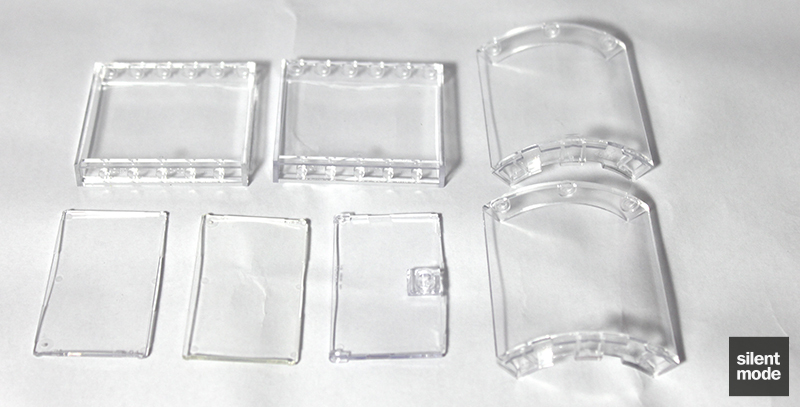 The short sides are very plain, but they include the curved edges of larger Friends sets (GBP 20 and upwards). 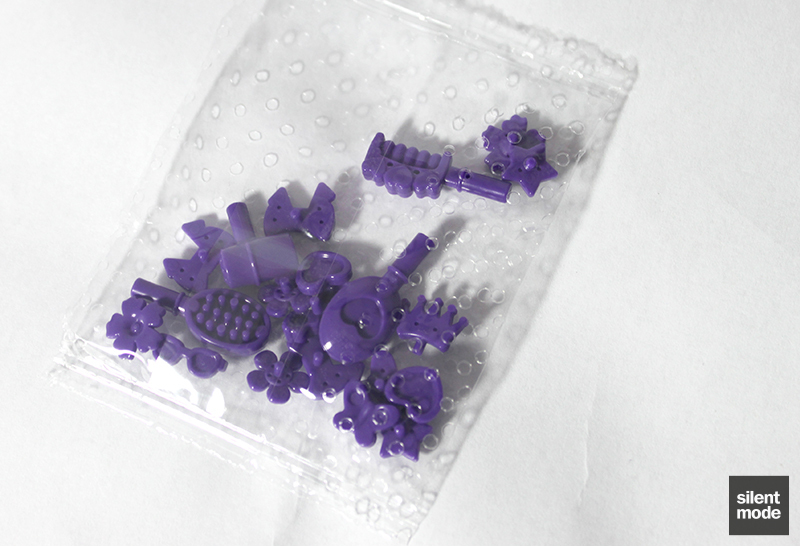 Note that the parts used in this set come from many countries, including – gasp – China. …two rather large bags of parts, two Bright Light Blue plates, a DSS and a very crisp instruction manual. 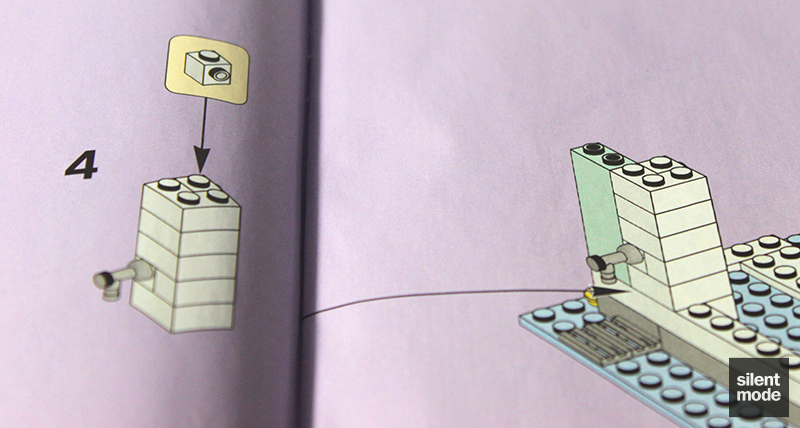 The instruction manual feels a lot smoother and of higher quality than usual, but maybe it’s just me. 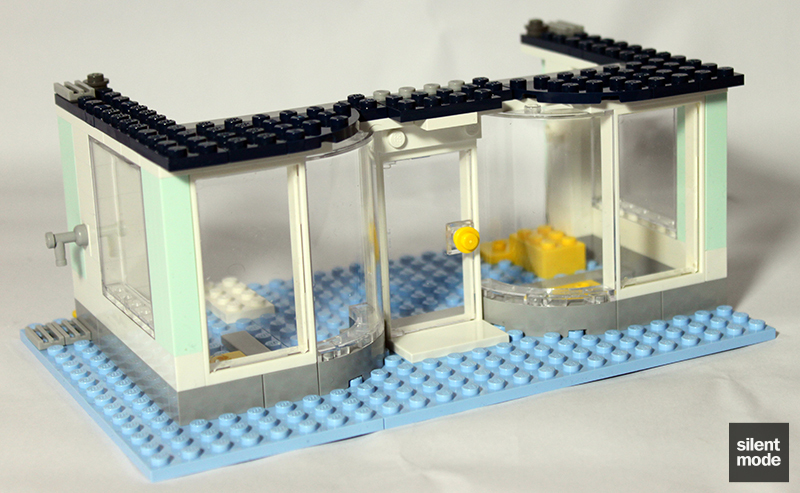 Fans of large transparent pieces for windows and doors, as I am, will be pleased. 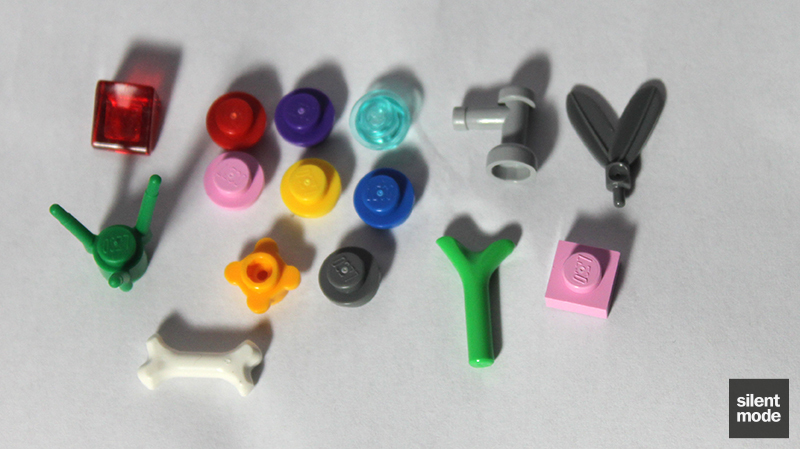 These are part of the elite few parts that are less expensive to obtain from LEGO’s Pick-a-Brick than through BrickLink, especially in this condition. There’s a lot of white in this set, and here’s a selection of the more useful parts. 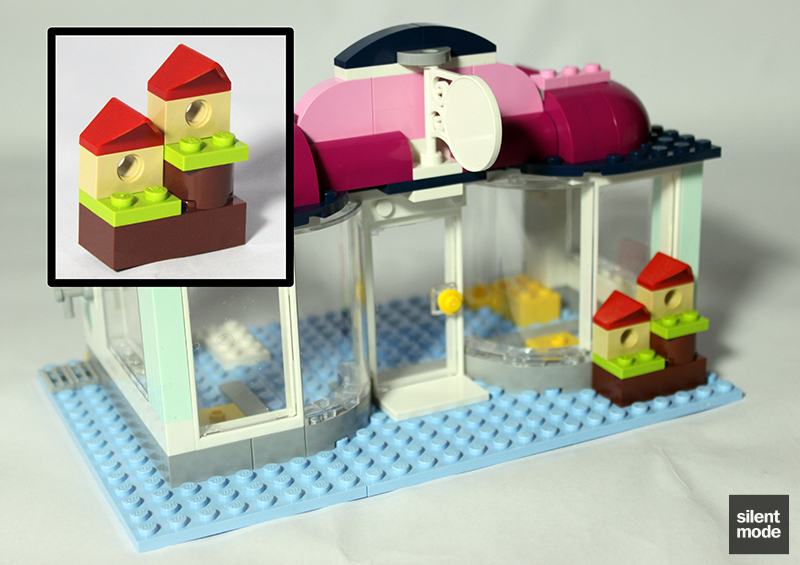 The Fabuland-style shop sign at the top is a new mould for 2013, very similar to the old-style Fabuland sign but most noticeably has spirals on the inside. This is currently the only set you can get this sign in, according to BrickLink. Some people don’t like 1x2x2 bricks for whatever reason, but I think they’re useful parts – especially for building walls and boxes. Making a return is the Medium Azure round brick with animal decorations, and we also have some more Light Aqua parts. 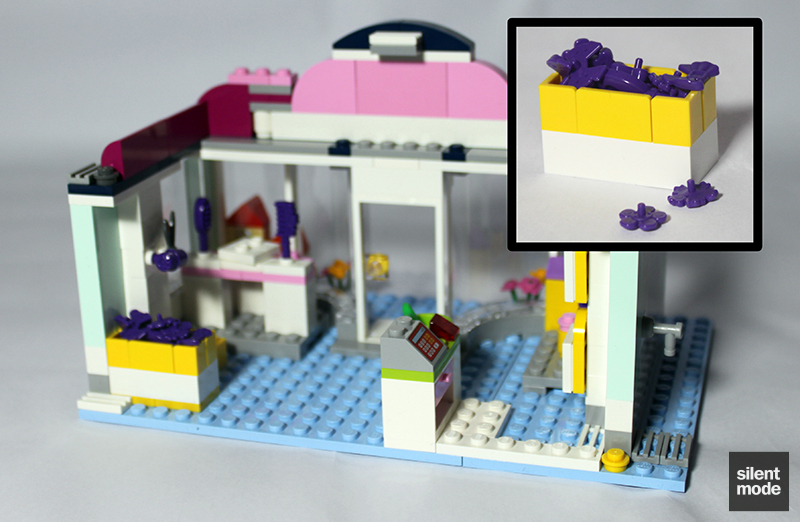 The 1x2x5 bricks are exclusive to this set at the moment, and I have a feeling they’re going to fetch steep prices. More specialised parts are provided in Magenta, while there are plenty of parts in Bright Pink. There are only two pieces in the entire set in my most favourite of these colours, Medium Lavender – and they’re good ones. You may be surprised to find Dark Blue parts in a Friends set, but the colour scheme has been altered somewhat for 2013. These are some very attractive pieces. Almost as common as White, these are most of the Light Bluish Grey pieces in the set – which includes two large “macaroni” bricks and our Friends-specific cash register. Not including the grille tiles (which often show up in Pick-a-Brick walls), this set has a decent but small selection of tiles. Ones to look out for include the 2×2 Yellow jumper plates (which were very scarce before this set, having only appeared in two others), the 1×2 Medium Blue jumper plates and the money tile. 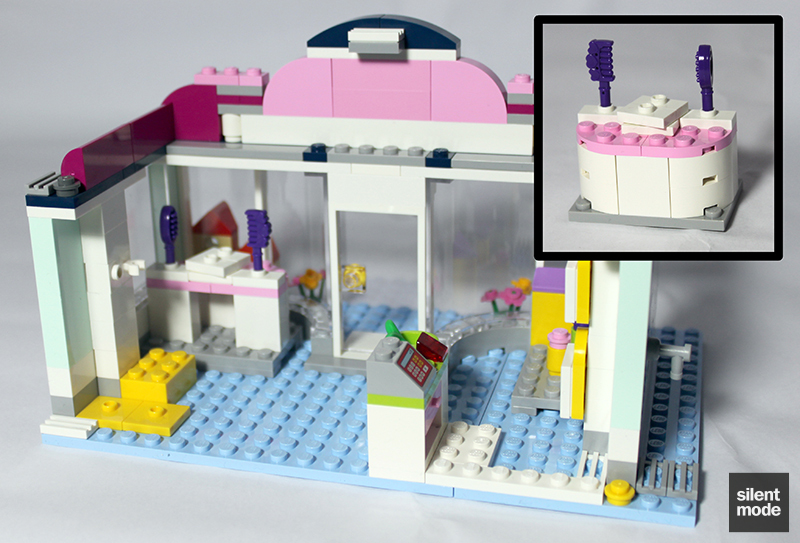 Almost as a staple of the larger Friends sets, this one comes with a bag of accessories: this being a salon, it’s a bag of grooming accessories. This is the first time these accessories have appeared in Dark Purple: in fact, all of the different colours are currently exclusive to one set. Some of the smaller and more useful parts include the equally rare Yellow corner panels, Pearl Gold taps, Bright Light Orange flower studs and Dark Bluish Grey feathers (used in the box art as shears). Again seemingly taking inspiration from Japanese art, the DSS has various animal-related designs and what look like pricing stickers. The sticker backing is white, and some of the detailing is in silver. It should come as no surprise that the figures arrive in four separate pieces each, and that they’re mixed in with the other parts. Fortunately there’s no confusion as to which bits belong to each figure. In the middle is Emma, who is looking incredibly attractive in her new outfit (although the legs are borrowed from Olivia and Sophie). She has her usual hairstyle. On the right is Emma’s friend Joanna, who looks a little lighter in complexion than Andrea. If I’m not mistaken she has an entirely new outfit, and sports Emma’s alternative hairpiece from the Butterfly Beauty Shop. No! It’s actually a new, albeit slightly modified hairpiece: note the fringe down the middle. And on the left is a new animal mould for 2013: a poodle. The description indicates the poodle is female, and with pink belt around its neck I should hope so! It has one hole – on top of its head – for a minidoll accessory. 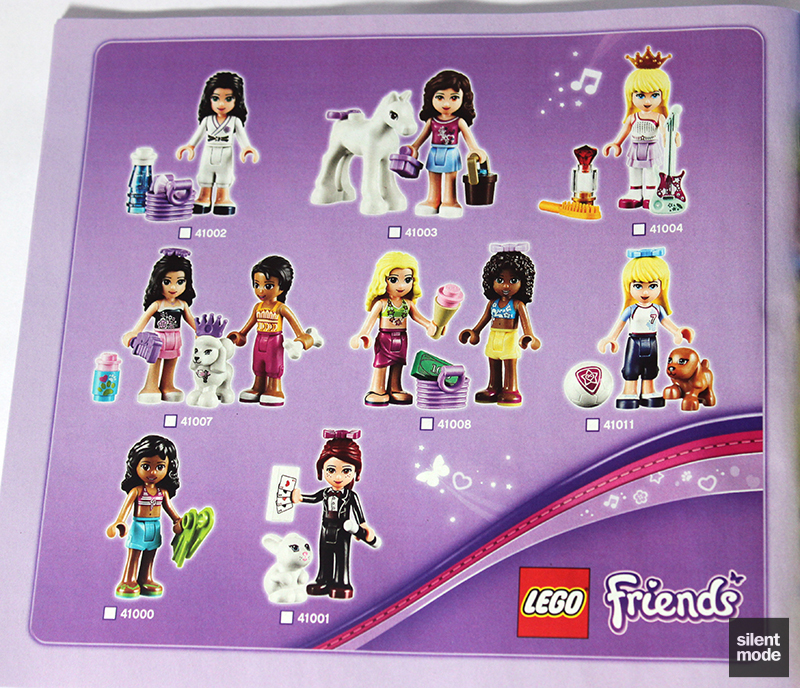 The poodle will also be making an appearance in LEGO’s new line of Friends collectible animals, along with some others. With a much different typeface than before, Gewinne!th graces the back of the instructions like a boss. This seems to be a new feature of having a Friends character demonstrate how to build the model: starting with the contents of Bag 1, assembling the model and only afterwards opening Bag 2. 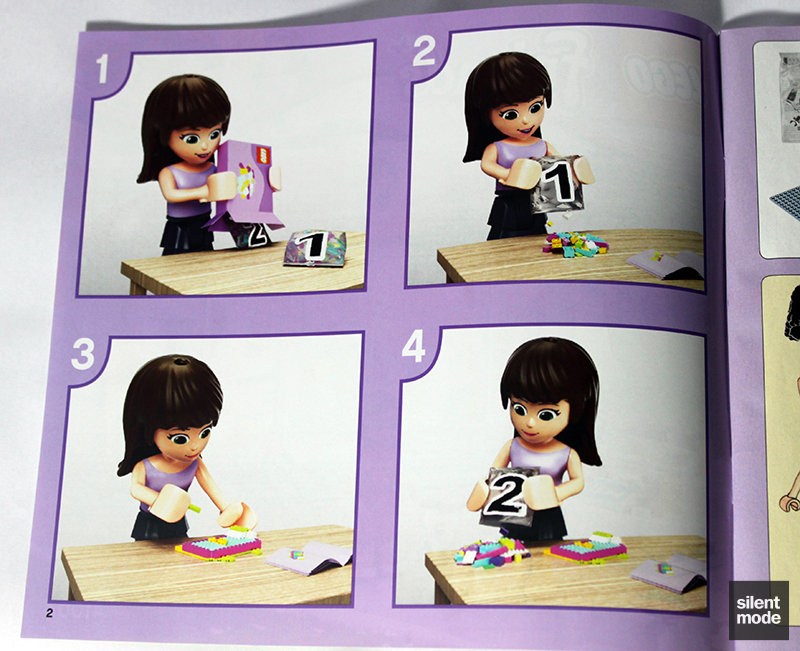 It appears to be Emma doing the demonstration, in which case LEGO has done the unthinkable and portrayed her as playing… with… herself… ahem. Following the instructions is incredibly reminiscent of the Butterfly Beauty Shop, and I wouldn’t be surprised if the same designer was involved. You’ll see how as you look at these pictures. The main difference is that we get to work on the building itself from the outset, rather than any miniature builds. The Bright Light Blue plates eventually combine to make the sturdy-enough 24×16 base, as the foundations are laid. 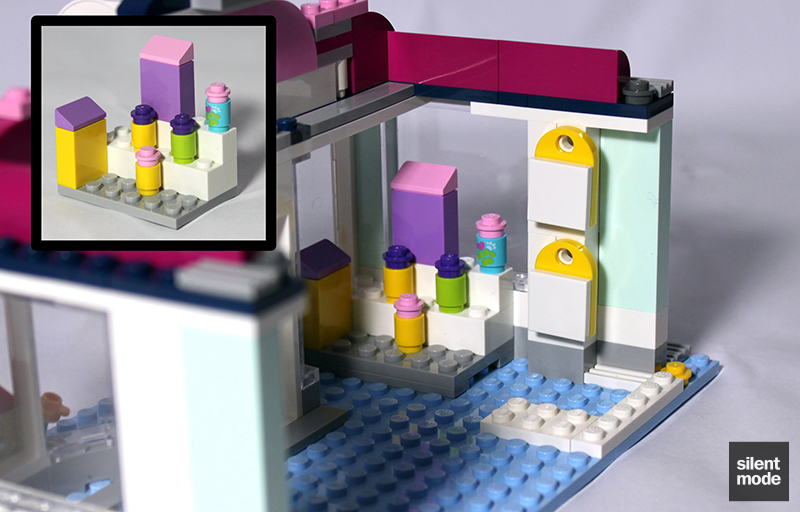 One tricky part occurs on step 16, where a SNOT brick is placed on the corner of a pillar. Look out for a very small bump on the right hand side to indicate where the stud on the side is meant to point. By step 20 we have most of the windows in place, as well as the front door. 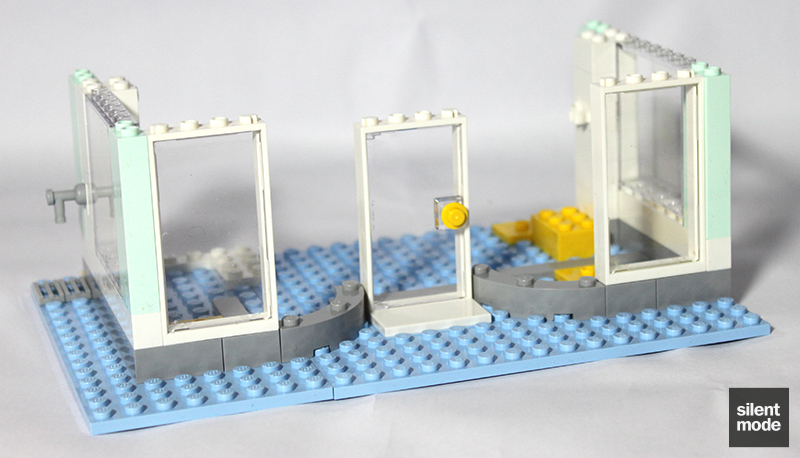 The Light Aqua bricks are used to form walls on the corners of the model. Most of the Dark blue pieces are used to form the roof of the building, and actually looks good against the other colours. Notice a cool technique used above the door: a 1×4 SNOT brick holding the 1×4 plate with two studs. With not long to go, the makeshift roof of the building is completed with the Magenta and Bright Pink parts. A very clever technique with the Dark Bluish Grey modified plate (at the top) is used to hold the shop sign in place, along with a single White jumper plate. 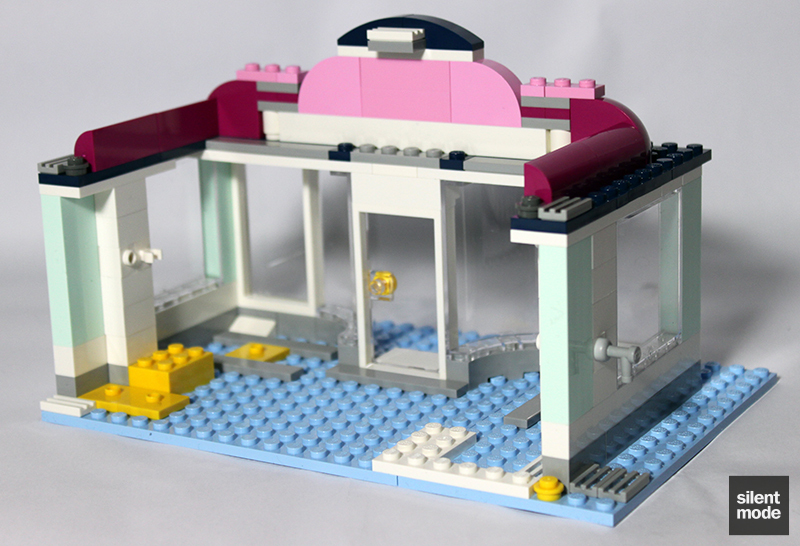 The building is complete, and Bag 2 contains all the parts required to furnish the shop with various displays and items. The first is what appears to be a set of bird houses, which are positioned just outside the shop. The second is what’s meant to be a selection of animal treats and products; the two boxes are supposed to have stickers on them to make them more convincing. These go inside the shop. The designers have implemented a cool feature, using the Yellow jumper plates and Light Bluish Grey tiles, where these displays can be positioned and removed easily. This definitely scores brownie points. 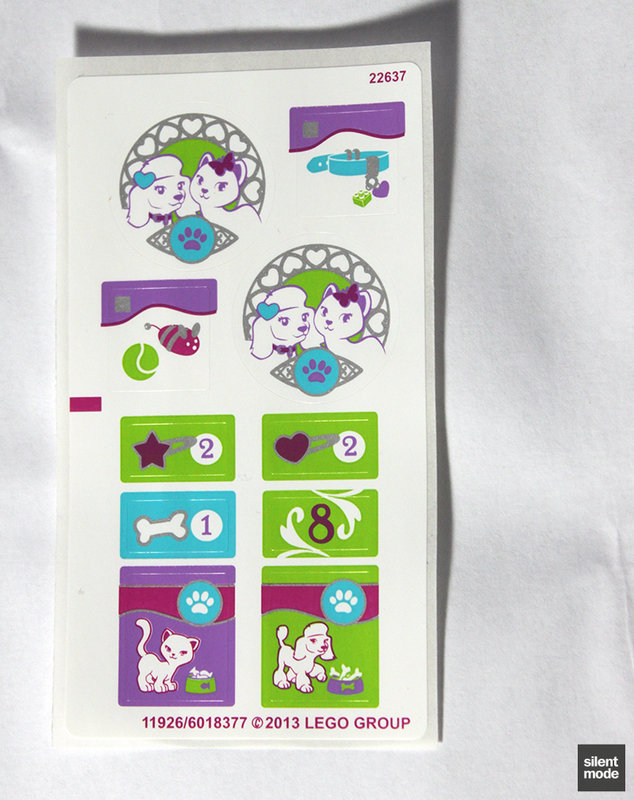 You’ll also notice a couple of packages on the wall; these are also meant to have stickers on them, used to represent animal toys and a fancy dog collar. The third is the necessary cash register, similarly to the Beauty Shop with just one drawer (where the money goes). You’ll be amazed to find that a stick of celery costs 15 of whatever currency is active in Heartlake City – no wonder everybody’s so thin! This and the bird houses give me the impression of this building being a pet shop rather than a salon, although in some cases they’re interchangeable. Fourth is a grooming desk, complete with turntable, that houses the brush and comb from the bag of accessories. Instinctively I knew that the turntable was for placing the poodle on, but it could also make way for a mirror. It’s a nice feature that could showcase a groomed poodle to passers-by, as the bird houses don’t get in the way. A pair of the feathers (acting as shears), along with the hairdryer from the bag of accessories, go on the wall. Next up is a basket or trough used to hold most of the decorative accessories, and for me this is where the overall design is let down. There’s way too little space for all the accessories to fit, so spillage is inevitable. Very handily the instructions tell you exactly which accessories are meant to go in the basket. As with the grooming station and the animal products display, the basket can be removed on its own – so no tipping the whole shop upside down to get to that one accessory. The last builds are yet another product display, as well as an odd-looking bath with hot and cold taps. Both of these go outside of the shop and are free-standing, independent displays. The product display is also meant to have stickers; this time for pricing labels for the remaining products. Cheapest of all are the doggy bones, sourced from the remains of male Heartlake City residents, costing only one unit of currency each. 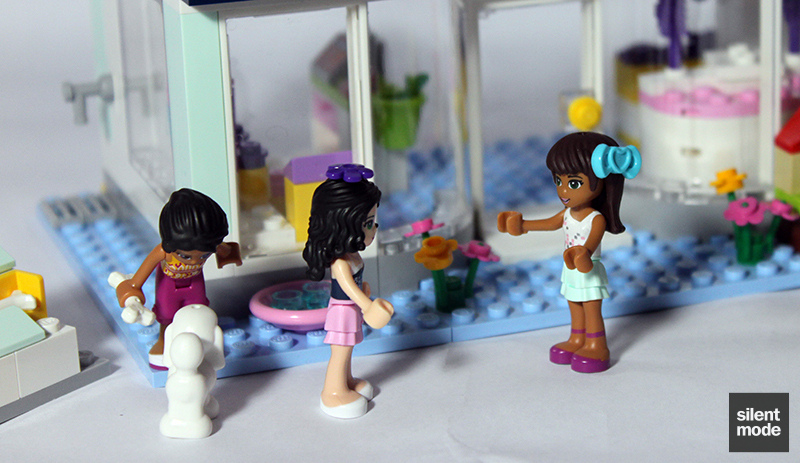 Doesn’t this remind you of the Butterfly Beauty Shop? Without the loiterers? It certainly does to me. At the moment I have absolutely no idea who is running the shop; I’d thought it would have been Joanna, but then Emma is helping her groom her dog. Since when was Emma so heavily into animals; wasn’t that Mia’s obsession? Whose shop is this?! A generous selection of small parts are left from the build, including the feathers and one each of the studs. We are also given a 1×1 Bright Pink plate! 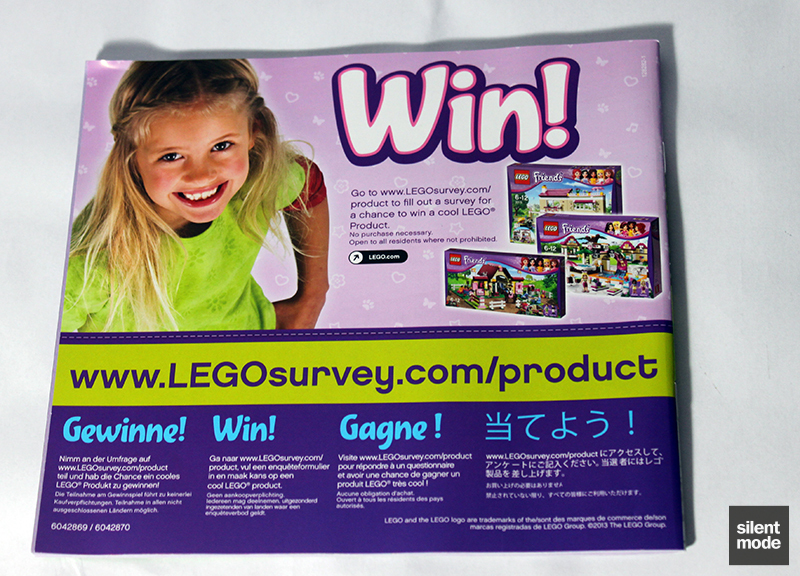 Near the back of the instuctions is a checklist of sorts for at least some of the minidolls to be found in 2013 sets. 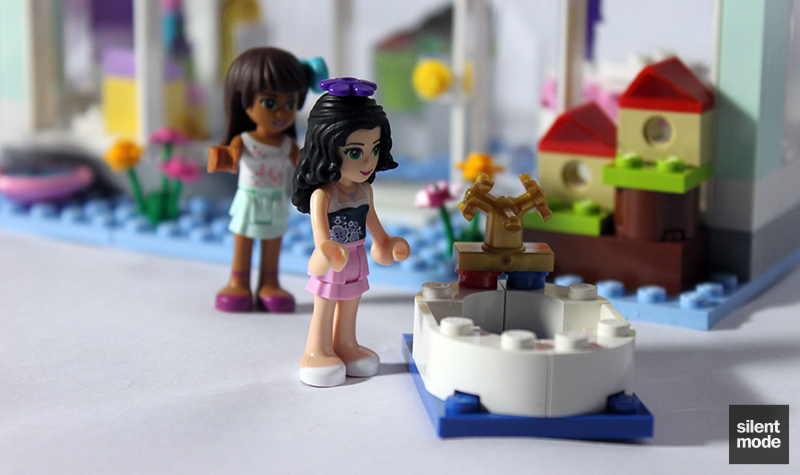 Pay particular attention to Stephanie’s guitar (*cough* BrickForge *cough*), a football (soccer ball), the hand of cards, and a new ice cream cone part in the centre. And now the bit you’ve been dying to see..
Sarah: Emma, come quick! I saw a mermaid in the doggy bath! Sarah: An actual live mermaid! I swear it was right there! Emma: *sigh* There’s nothing here! Sarah: But it was right there a minute ago! Emma: Are you playing games with me? I’m busy helping out with the store! Sarah: It probably went back in! Emma: *screaming* I’m soaking wet! Joanna: Emma! Are you okay? Emma: Get me out! This water’s cooooooold! Sarah: Oh no, your new clothes are all wet! Joanna: Take her inside and help her dry off; there should be fresh towels. Sarah: Come on Emma… let’s get you dry! Sarah: There there, have you warmed up? Emma: I’m fine, I can’t believe you pushed me into the tub! Sarah: I didn’t mean to, it was an accident! Emma: You’ve been acting really strange these last few reviews, you know that? Sarah: *taken aback* uh… what do you mean? Emma: Well… just that… we’ve seen a lot of each other recently! I don’t even spend as much time with the others as you! Emma: …It’s okay, I like hanging out with you. Emma: Yes… but I’ve got to get back to work, okay? And please don’t get me wet again. 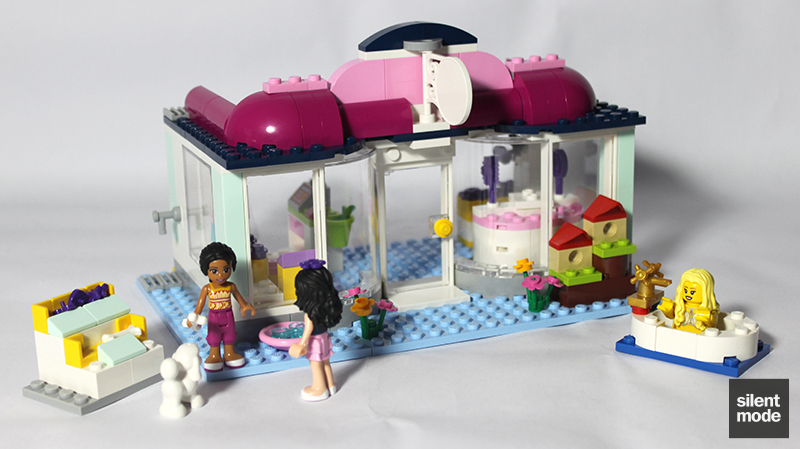 Putting to one side that this set has a lot in common with Butterfly Beauty Shop, this is a very well designed, well put-together build from the outset. I don’t feel that anything in this set has gone to waste in terms of parts and building techniques: even the flowers outside of the shop use all four flower parts from the sprue! That’s completely unheard of, as far as I know. I was very impressed with the way the sign was attached to the building, and the easy removal and placing of the shop displays was an excellent idea. The building itself has a 50s/60s vibe, and looks like it could stand on its own, but would be better suited as part of a strip mall. I guess I’m still convinced that it’s more of a pet shop than a pet salon, although it could easily work either way. I still have no idea if either Emma or Joanna – or maybe even someone else – is meant to be running the shop, but that’s a decision easily left to whomever’s playing with it. There is a very good selection of parts, and most desirable for me are the Light Aqua parts and both minidolls. I haven’t yet seen a minidoll design more appealing than Emma in this set… maybe me and her should just get a room already. Joanna isn’t bad either, and fans of the darker-skinned minidolls will be pleased to have two more body parts to add to their collection. Whether you’re into the minidolls or not, there are desirable parts in this set for just about everybody, and the set demonstrates ways of using some of the more specialised parts. 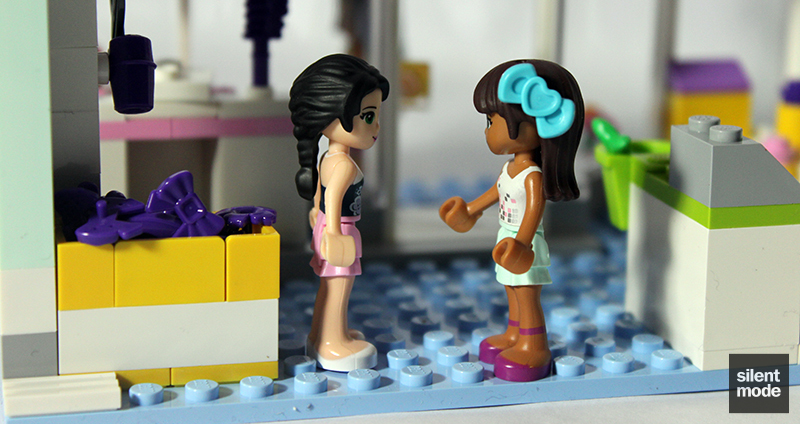 The only real criticism I have is with the basket or container meant to contain minidoll accessories: it’s just too small. Personally I would have preferred to have a container that was too large. However, those accessories will probably be used by the target audience rather than held in a basket. 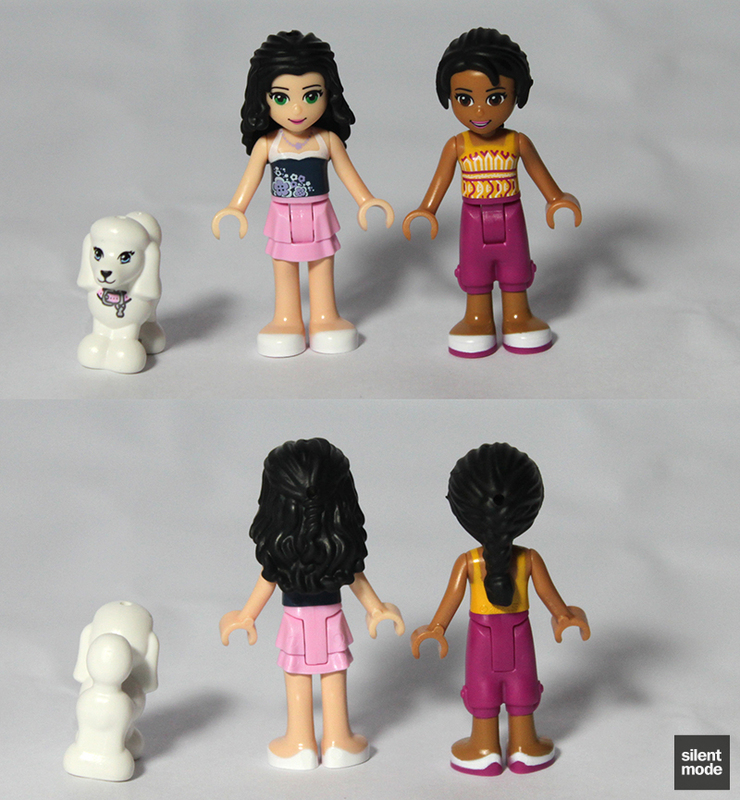 Given that the poodle will appear in LEGO’s upcoming Friends collectibles, it wouldn’t be worth buying this set for the included animal. If you’re not planning on going down the collectible route, or you don’t mind having animals, it’s a nice addition. As far as the price goes: I was fortunate enough to get it for slightly less than RRP, but it’s maybe a little expensive for what you get, especially in GBP. This is one to keep a very close eye on for promotions and discounts. The main building has style, perhaps standing out from the rest of the Friends theme with the inclusion of Dark Blue, but it's a great building nonetheless. The minidoll designs make this set worth getting. 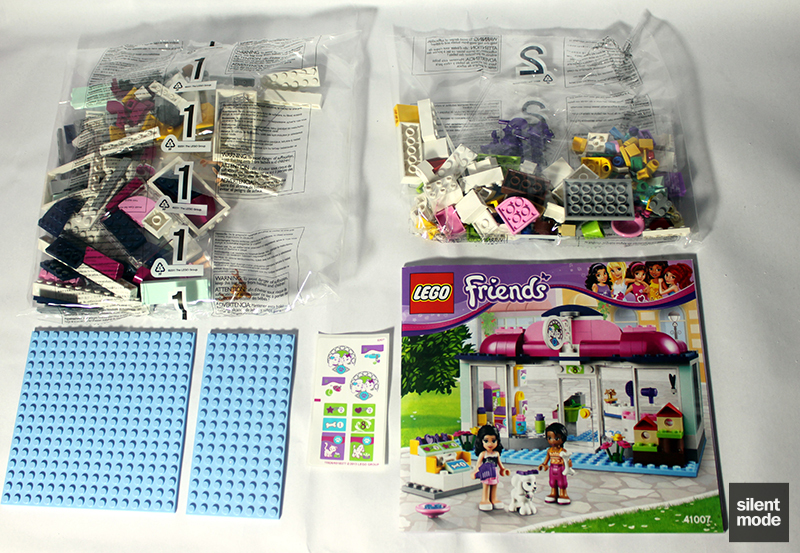 I found this set to be easy enough but very quick to build; the different parts for each section separated into different bags helped a lot, and there weren't too many small parts to fiddle with. Some excellent building techniques were used, including the partial roof and the sign. 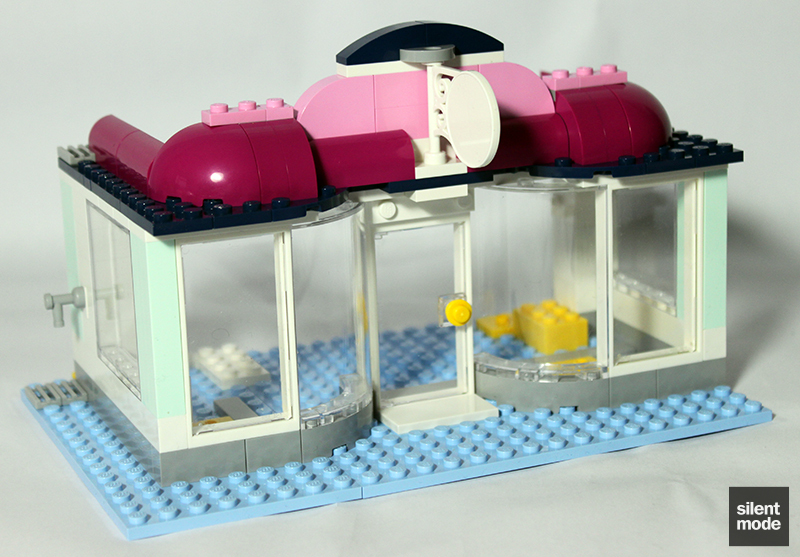 The Magenta and Bright Pink parts on the roof may be too big and specialised for common use, but just about everything else can be made part of an MOC. There are at least three (currently) exclusive parts in this set. For an AFOL this serves as more of a display piece than an interactive one; however it would give the target audience plenty to do, whether "grooming" or accessorising the poodle, or simulating transactions. It's worth buying the set at RRP if you have to have either of the minidolls or exclusive parts (as the prices will be high elsewhere), but for anything else I would recommending holding out for a discount. Based on these scores the Pet Salon scores on average… 7.8/10. Thank you for reading this penultimate review for 2012, and thank you for you support. Here’s to more shenanigans next year!